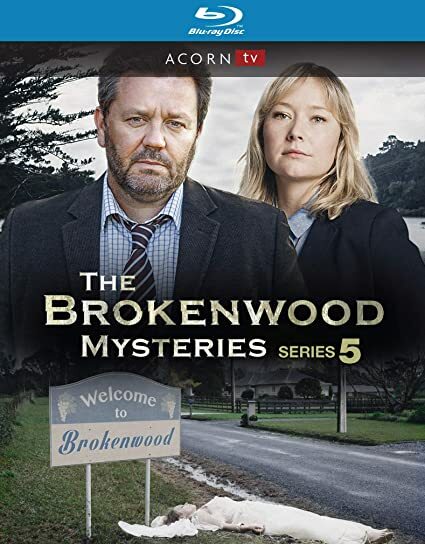 Brokenwood Mysteries: Series 5 - BUY THIS BLU-RAY! Murder and mayhem abound in Brokenwood, a charming New Zealand town whose denizens are prone to criminal impulses that belie their idyllic surroundings. A transplant from the big city, Detective Senior Sergeant Mike Shepherd (Neill Rea) has finally been accepted as a new resident in the tight-knit community. Together with his Brokenwood-born partner, Detective Kristin Sims (Fern Sutherland), and enthusiastic DC Sam Breen (Nic Sampson), they solve grisly crimes and uncover secrets long buried by the town’s idiosyncratic inhabitants. In Series 5, Shepherd and his team investigate the death of an amusement park owner killed on his own haunted-house ride, a bachelorette party gone horribly wrong, the systematic targeting of a will’s beneficiaries, and a gruesome electrocution in an abandoned asylum. Filmed on location in the stunning New Zealand countryside, these four feature-length mysteries are an “engaging, compelling, and humorous series of whodunits” (The British TV Place). THEN SEND IN YOUR NAME AND ADDRESS TO contests@efilmcritic.com. Put "THESE MYSTERIES BREAK ME" in the subject line and cross your fingers. We will draw names and one of the DVD packages from Acorn Media could be yours. Only 1 entry per household.